Left: Kevin carving Major Duncan Chapman's bust. Right: The finished bust. Kevin Banting started carving in 1997 and is self taught. He had spent all his life as a builder and bricklayer and now lives on a farm 15 kilometres from Maryborough. Another of Kevin's carvings, a large bust of an Aboriginal carved into an ironbark log, is located approx. 10 kilometres west of Maryborough on the Biggenden Road. From Biggenden Road, turn right into Woocoo Drive, immediately turn left into the parking area of the Woocoo Community Centre. To the rear of the hall is Wook-Koo Park. The bust is just one of many artworks in this picturesque area containing lakes, covered picnic tables and children's playground. 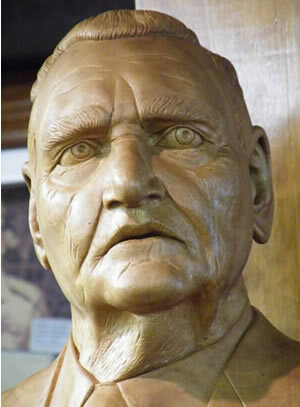 If you are planning a visit to the Stockman's Hall of Fame in Longreach, look in the foyer for another of Kevin's carvings – a bust of a stockman titled 'The Ringer'. Above: Kevin measuring Keith Payne VC AM. 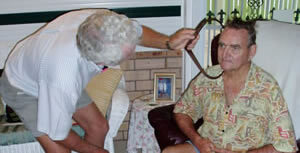 When Ernie retired as a Postmaster, after working in many places around Queensland including Mitchell, Yeronga and Bulimba, he took a carving course at TAFE. Firstly carving pieces for his family and in later making pieces for community groups that he and his family had been associated with over his lifetime. 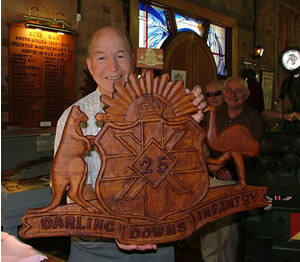 His work can be seen in carved plaques at Esk, Crows Nest, Raceview and Theebine Schools and Bauple Museum. 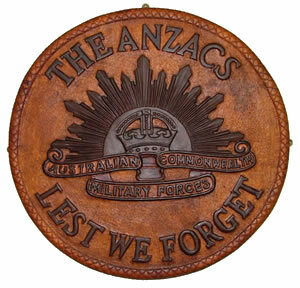 The first carving Ernie completed for the Military Museum was a large round 'Lest We Forget' plaque. Ernie served in WW2 in the 6th Division in Greece and Syria. Ernie has made a total of seven plaques of the badges from many Battalions, with the latest presented in September for the 25 Battalion, having special significance. Both his wife's father and brother served in this unit. The Regimental Plaques displayed in the Museum include 9th, 47th Wide Bay, 49th, 31st, 25th, Queensland Mounted Infantry-Queensland Imperial Bushmen and Australian Commonwealth Horse. Ernie Blackwell presents his new carving to the museum in 2008. Woodcarving in silky oak by Ernie Blackwell.